Blinded as a child by an accident that exposed him to radioactive chemicals, Matt Murdock was empowered by those same chemicals and gifted with enhancements to his other four senses that more than made up for the loss of his sight. Obsessed with justice after his father’s death at the hands of gangsters, Matt would grow up to become a lawyer and fight crime as the vigilante Daredevil. But all that is behind him. 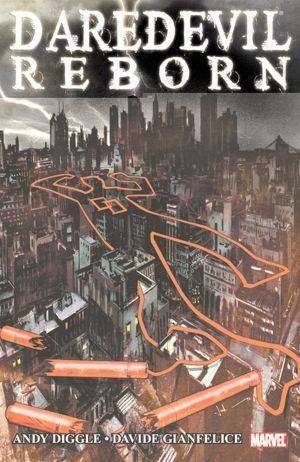 Having abandoned New York City following the latest in a long line of difficulties, Matt Murdock is a man on the run. From the law. From his enemies. From his own past. When his wanderings lead him to a small town in the American Southwest, it doesn’t take a blind man to see that the sheriff is crooked and the local land baron/gang leader Calavera is the real law in town. With his own life and liberty threatened, Matt would be content to move on and leave the town behind. But when he learns that innocents are endangered, including the blind son of the former sheriff, Matt will have to choose between the peaceful life he longs for and the heroic destiny he’s long denied. Author Andy Diggle is an old hand at this kind of high-action story with low-powered superheroes and his Green Arrow: Year One is a personal favorite of mine. One thing I must note is that this volume is a wonderful jumping-on point. Unlike many recent Marvel Comics, this volume is easily accessible to new readers who might not have read a Daredevil story before. This was something of a relief to me, as I hadn’t read Daredevil for several years myself and wasn’t up to speed on current events. The plot is fairly standard stuff but Diggle makes it seem fresh and new. With the Southwestern background, a boy in need of a hero, and a story based around Murdock’s internal conflict between a desire for normalcy and his personal sense of justice, comparisons to the classic western Shane are inevitable. But Diggle’s tale avoids any cliché romance with the blind boy’s mother. And Matt’s final battle against the corrupt forces running the town come down to the battle of one man against many rather than a war between two factions. Many Daredevil artists drown their artwork in ink, trying to physically convey the literal and figurative darkness of Matt Murdock’s world. This style is one of the hallmarks of long-time Andy Diggle collaborator Jock, who produced the cover art that separates each chapter of this volume. The cover of this trade paperback is particularly noteworthy – a glorious piece which depicts the slums of Manhattan in black and grey, the darkness broken only by white-hot lightning strikes. Above it all, traced with Daredevil’s famous custom nunchucks, lies the outline of a dead man. While Jock’s style would be effective for a story set in the alleys of Hell’s Kitchen, it might be ill-suited toward a story set in the American desert and interior artist Davide Gianfelice is wise enough to limit his own inks accordingly. With the character-design skills of John Romita Jr. and a style that evokes Michael Lark without being quite so muddy, Gianfelice was a good choice to handle the pencils and inks of this book. Colorist Matt Hollingsworth also deserves praise for his choice of palette. One content note – this book earns it’s T (13 and Up) rating. There’s a goodly bit of ultra-violence, bloodshed, and some subtle language indicating that the former sheriff’s widow has turned to prostitution to make ends meet. Still, there’s nothing that I believe would mark this volume as unsuitable for most teen graphic novel collections.